They’ve enjoyed 11 years in their little nest with a harbor view, through good times and bad – Hurricane Isabel in 2003, the hatching and departure of all those dear chicks over the years, the surveillance caper in 2010. They’re a couple who’ve weathered adversity, together. Choosing their mates when they’re around 3 years old, osprey usually begin breeding when they’re 5. That makes my friends, Opal and Oscar, at least 14 and perhaps 16 years old. (Osprey usually live to be 25 years old.) The strength of a mating pair depends primarily on feeding – how well they feed one another, and how well the male feeds the nesting female and their chicks. Male osprey are noted for eating only the head and tail of a fish, saving the nutritious mid-portion to feed the nesting female and chicks. Oscar and Opal are a devoted pair. I watched them build their original nest in 2001. (I’ve been walking the Naval Academy almost every morning since my retirement in 2000.) They chose a perfect location – the farthest lightpost at the outer-most point of the Academy grounds. Opal and Oscar knew what they were doing. 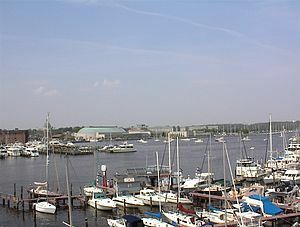 From their living room, they have views up and down the Severn River, out into the Chesapeake Bay and across the Annapolis harbor all the way to Spa Creek. The football practice field gives them an unobstructed view of any approaching predators or threats to their fledglings. Back in September, 2003, my osprey friends, and all of us in Annapolis were surprised by Hurricane Isabel. She devastated the Bay coastline, tearing up trees and producing flood waters 10 feet deep or more along the Bay’s shores. The Academy was flooded above the first floor in dorms and classroom buildings. And, Oscar and Opal’s nest was badly damaged, though not destroyed. I feared they may have lost their lives. But, before two weeks had passed, the osprey were back! At first they tried restoring their nest, but eventually, they gave up and simply built a new nest atop the original. Before long they had a two-story home! And then another threat – In 2010, the Naval Academy began installing security cameras around the perimeter of the Yard. That meant a camera was to be installed on Oscar and Opal’s lightpost! It was winter, and the couple had joined the general Florida migration of birds and people to Florida for a well-deserved winter vacation. Back at the Academy, a great truck deposited an huge “cherry picker” vehicle beneath the vacant nest site. Men in harnesses rode the cherry picker’s “nest” up, up, up, and the electricians installed a camera next to the nest. But there was more. A large, plastic owl was secured beside the camera, in front of the nest! Were they worried that the nest needed protection while Opal and Oscar were away? No… Did they think this fake owl would scare away our intrepid osprey? Really? This is the osprey couple who had faced down Hurricane Isabel. Intimidated by a plastic owl? Hardly! In the spring I waited anxiously to see what would happen. And then I heard them, that distinctive osprey sharp, high-pitched call that echoes like sonar off buildings and water surfaces. They soared in from the south, over the football field and… yes, settled their graceful, powerful wings on the lightpost adjacent to theirs. From next door they checked out the new additions to their property – the camera and plastic predator. And, for a few days I saw them swoop and swerve over the foolish owl, whose plastic head revolved a little to the right, then a little to the left. But now, in the prime of their breeding life together, Opal and Oscar seem to be fed up with the hassles at home. They’re moving! Over the past weeks, the couple has been building a new nest! Perhaps they’re going for something a bit smaller? more modern? easier to maintain? I’m not sure. But mornings now I watch them feather their nest with fresh Bay grasses, new twigs, bits of bark – all the components that will make them feel quite at home. They’ve still got their view – after all, they’ve only moved 20 yards further down the yard. No camera humming, no silly owl peering at them night-and-day. Opal can add all those little niceties she’s seen in friends’ nests, and Oscar can stop worrying about that first floor mess that was the foundation of their former home. And, the U.S.Naval Academy has given them a wonderful housewarming gift – or I think they have. After conversations with the Academy’s Office of Environmental Issues, they’re taking Opal and Oscar under their wings – in a manner of speaking. They’re going to look after the nests – both old and new, just in case the couple decides to move back to the homestead. It seems the osprey share many qualities of a fine sailor and officer – tenacity, wisdom, expertise, loyalty and stewardship. This entry was posted in Adventures, Life Lessons, Uncategorized and tagged Bird nest, Chesapeake Bay, Hurricane Isabel, Osprey, Severn River. Bookmark the permalink. Thank you dear Jan for saving Oscar & Opal’s nest from the marauding navy environmental office. Wonderfully witty blog & I learned a lot about our feathered friends. All creatures, large & small, are lucky to have you on their side.